For many moms, the prospect of starting your baby on solids can be exciting and terrifying. 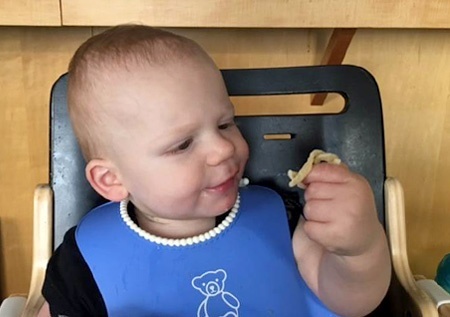 Kristin Sears shares her homemade baby solids experiences, and passes along several tips that will make preparing food for your baby simpler. For many moms, the prospect of starting your baby on solids can be equal parts exciting and terrifying. Since I couldn’t exclusively breast feed, I wanted to at least have my son Lukas exclusively eat homemade baby food. But I also had no idea how to go about preparing and feeding solids. So after countless hours on the internet and speaking with fellow moms and Zone experts, I bring you my experience so that you won’t get lost in baby food research purgatory. Lemon juice concentrate contains the following preservatives: sodium benzoate, sodium metabisulfite, and sodium sulfite. The levels are fine if you are an adult, but because of the light weight of child, their levels could represent a potential toxicity when calculated in terms of mg/kg body weight (the standard way to determine toxicity). Read each organic label carefully. Many store-bought food products will have some preservatives if it’s in a liquid form. Baby-Led Weaning (BLW) – This is an alternative method for introducing complementary foods to infants. The idea is they feed themselves hand-held foods instead of being spoon-fed by an adult. Many of my mom pals have had great success with this method, but Lukas and I struggled with it. He would grab a floret of Broccoli, sniff it, bang it, even pet it, and then drop it on the floor. The process would take roughly 5 minutes. So to mom’s who have the patience for this method, I tip my cap. Rice Cereal – I didn’t pay this option any mind because I wanted to start Lukas off as much in the Zone as possible. After reading reports that rice cereal may be high in arsenic, it didn’t sound terribly safe or super appetizing. Purées – These seemed more my cup of tea. Let me explain. At first, I tried to give Lukas just a taste by putting puréed avocado in a mesh feeder, but he indicated he was more interested in being spoon-fed. He made this quite clear when he’d grab my spoon out of my hand while I’d eat my Greek yogurt. For making purees, I used a “complex equation” of what’s healthy…and what’s easy to make. For me, I found apples, blueberries, broccoli, cauliflower, Butternut squash (with the seeds already removed) and peaches to be the healthiest and easiest. I skipped bananas and avocados because they quickly turn brown once exposed to the air. I made a week’s worth of food at a time so solids wouldn’t eat up all of my time. I also rotated in carrots and broccoli until I started reading up on nitrates, which in infants could cause an unusual type of anemia. However, I read that babies’ stomachs are usually strong enough to handle it and nitrates can give rise to increased blood flow to the brain. Since they are in rotation with so many other veggies, I felt at ease with using them. But as you may know, carbs alone will not put you in the Zone – not even for babies. Therefore, I needed to find some appropriate protein sources. I started with plain, Greek yogurt. An ounce either on its own or puréed with apples or blueberries did the trick. Then I’d freeze it. But soon I learned some commercial Greek yogurts use waste products from cheese production to get a higher protein content, so I needed to find other sources. Enter Zone Orzo! I’d purée, freeze and reheat an ounce of the Orzo and he’d love it. One thing to note: the Orzo is technically Pasta, which has egg in it. So make sure your baby isn’t allergic to eggs before serving. 9 month mark: Bite-sized Binge! Around 8.5 months, Lukas started making it very clear that he was ready for finger foods by smashing his hands in his purées and smearing them across his face. This could not have come at a better time because I had pretty much run my blender into the ground. I wanted to make him finger foods, but I was afraid of him choking since he only has two teeth. All I’d see on websites were “make the food bite-sized.” What is considered bite-sized? To whomever I asked I got different answers. Come on, I’m exhausted! Just give me a size, Internet! Finally, I decided to make the pieces as small as humanly possible (pinky nail) and increased the sizes once I was comfortable with his chewing (or gumming) skills. I would also mash steamed veggies in a mashing bowl so what I did still spoon-feed had a lumpy consistency to help him hone his chewing skills. He now enjoys the same foods as above, but in bite-sized form. I also added the Zone Fusilli, cut in half with a drizzle of extra virgin olive oil. When I have the energy, I prepare scrambled eggs in the morning. When I don’t have the energy, I microwave a package of steel cut oatmeal (1 pouch is 8 ounces which make 3 breakfasts worth) and mix in reheated Zone Orzo (1 ounce per serving). So far, Lukas has happily devoured what I’ve made, but if there are foods that turn your baby off, try adding the contents of a MaquiRx capsule to give a sweeter flavor without the added sugars. The extra polyphenols will also encourage a good microbe composition. As he got more comfortable with chewing, I took a page from the BLW playbook and introduced banana pops! You take a whole banana, cut it in half, lightly cut around an inch below the top and remove that section of the cut peel. As your baby eats, keep cutting and peeling the skin further and give the other half. This I serve with an ounce of the Zone Pasta. One last thing. Around this time I introduced liquid fish oil. I was going to hide it in his food but that’s no longer necessary now that I have OmegaRx 2, which has virtually no fishy taste. I just put about 1 ml (or ¼ tsp) in a spoon and he gobbles it up. Seriously, moms – this is a GAME CHANGER. Food allergies are supposedly rare, yet I see it more and more. Experts say the spike in allergic reactions comes from an increased compromise of gut health that gives rise to gut immunological reactions and inflammatory responses. In layman’s terms, a higher consumption of foods rich in refined carbohydrates will result in a higher risk of allergic reactions from generation to generation. Cow’s milk and honey should be avoided during the first year of life, but other allergy-prone foods such as peanuts, eggs, seafood, wheat, and soy, should be tried earlier on in the solid feeding process. The reason? Many believe it’ll lessen the chance of an allergy. I first gave Lukas a taste of organic peanut butter, then eggs. Those 15 minutes between feeding Lukas and watching for a reaction felt like days. Luckily, no bad reaction. This led me to feel pretty confident about what he could eat. Surely introducing raspberries a week later wouldn’t be a problem. Or so I thought. Try new foods one at a time. Don’t try new foods on a weekend unless your Doctor has weekend hours. Don’t reintroduce foods that previously caused a reaction until after your baby is 12 months old. 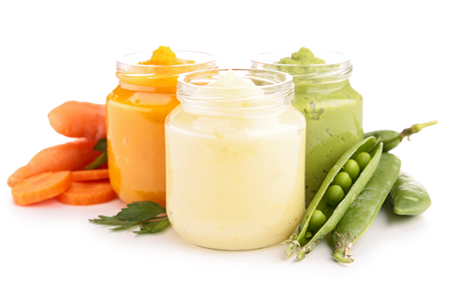 Making baby food isn’t always feasible and can seem a daunting task. Don’t be overwhelmed. Instead, think about it in terms of giving your baby the best defense against childhood obesity. A child’s gut is not fully formed until they are 3 years old. What your baby is eating now will determine the final composition of the microbes in their gut. Refined carbohydrates have no fermentable fiber so the microbes in your baby’s gut won't develop correctly. So try as many fermentable fiber foods as your baby can muster (veggies and fruit), and watch the benefits unfold.